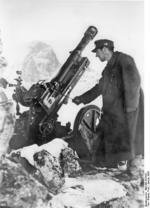 ww2dbase7.5 cm Gebirgsgeschütz 36 mountain guns were designed by the German firm Rheinmetall between 1935 and 1938 to meet a German Army requirement for modern mountain guns to replace those that were still in service since WW1. They were designed so that they could be towed completely assembled or could each be broken down into eight separate pieces for carrying by pack animals. They were relatively light for their firepower, thus at lower elevations they would at times jump excessively, with the trail spades acting as fulcrums; this issue was never resolved, and instead, gun crews were forbidden to fire these guns under 15 degrees of elevation. Each gun required a crew of five men. These mountain guns were typically organized into batteries of four guns with two to three batteries per battalion; a mountain artillery regiment would usually have one to three battalions of these guns. They were used by both German Army and Waffen-SS artillery units. While 1938 production numbers were unknown, between 1939 and 1945, 1,193 were built.